At the current pace of progress, we are more than 100 years away from gender equality in the C-suite. If NASA launched a person into space today, she could soar past Mars, travel all the way to Pluto and return to Earth 10 times before women occupy half of C-suite offices. Yes, we’re that far away. Today, LeanIn.Org and McKinsey & Co. are releasing Women in the Workplace 2015, a comprehensive study of the state of women in corporate America. In total, 118 companies and nearly 30,000 employees participated, sharing their pipeline data, HR practices, and attitudes on gender and job satisfaction. Our research reveals that despite modest improvements since 2012, women remain underrepresented at every corporate level. And it turns out the drop-off in senior ranks is not mainly due to attrition. Women, on average, are not leaving these companies at higher rates than men. Rather, they face more barriers to advancement and are less likely to reach senior leadership positions. Women see an uneven playing field—a workplace tilted against them. Women are twice as likely to believe their gender will make it harder to advance, and senior-level women view gender as a bigger obstacle than entry-level women do. The unfortunate reality is that women at every stage in their careers are less interested than men in becoming a top executive. Contrary to popular belief, this is not solely rooted in family concerns. Our research shows that even women without children cite stress and pressure as their main issue. This points to another possible explanation for the leadership ambition gap: The path to senior positions is disproportionately stressful for women. When women get stuck, corporate America gets stuck. There is a wealth of evidence that diversity helps teams and organizations perform better in terms of innovation, creativity, revenue and profits. Using the talents of our full population is critical to our economic growth, corporate productivity and individual happiness. To get more women into leadership roles, we have to address our culture’s discomfort with female leadership. Young girls are called “bossy” on our playgrounds, while young boys are expected and encouraged to lead. This dynamic carries over into the workplace, where women walk a tightrope between being liked and being respected—and men do not. This persistent bias creates a double bind for women that we must surface, acknowledge and fix. Companies report that their CEOs are highly committed to gender diversity. Unfortunately, that message is not getting through. 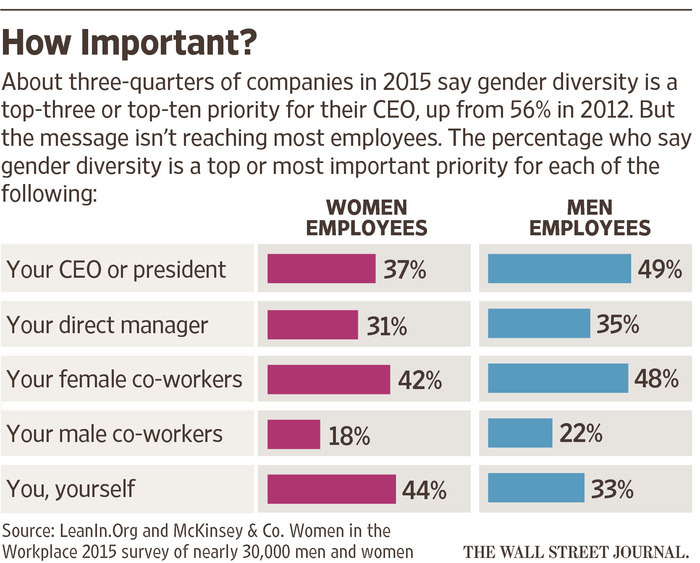 Fewer than half of employees believe that gender diversity is a top priority for their CEO. While a majority of companies surveyed offer career development and flexibility programs like extended leave or reduced schedules, few employees take advantage of them. Ninety percent of women and men—yes, 90%—believe taking extended leave will hurt their careers, and more than half believe it will hurt them a great deal. Despite these concerns, mothers and fathers are more likely than childless adults to say they want to be promoted and become a top executive. It’s in a company’s best interest to figure out how to get employees to use the programs they offer to help balance work and home life so everyone can reach his or her goals. This report is a reminder of how much is left to do. The first step to improvement is measuring progress. Companies that participated in this study have begun establishing benchmarks and goals and gathering data they can use to compare themselves with their peers. All organizations should be tracking their progress on diversity—measuring their pipelines in all functions and at all levels, as well as compiling cultural and attitudinal data. Transparency and training are vital. If employees see real, measurable gender inequities in their organization, they will be more likely to work toward solutions. Implementing training so employees learn how to identify and counteract gender bias is critical, especially for managers, who shape the day-to-day work experience of most employees. Finally, women are hurt by having less access to senior-level mentors and sponsors in the workplace than men, and this needs to change. Peer support can be part of the solution. More than 650 companies have Lean In Circles, small peer groups that meet regularly to help women pursue their ambitions—and 83 percent of members say they are more likely to tackle a new challenge or opportunity as a result of the support their Circle provides. Ms. Sandberg is the chief operating officer of Facebook Inc. and the founder of LeanIn.Org.